One of Hannah's favourite noises to make for the past few months is trumpeting like an elephant. You ask, "What sound does an elephant make?" and she responds with such a convincing noise that you would think she is being raised by a herd. So this past weekend when Hannah first saw 50 year old Asian elephant Limba bathing in the stream at her home, the Bowmanville Zoo, it's not a surprise she trumpeted like an elephant. Other than riding an elephant many moons ago at the Toronto Zoo, I have never been so close to an elephant. And I certainly hadn't fed one. 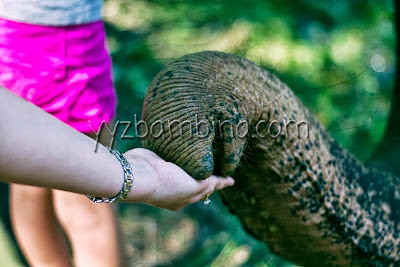 Limba was happy to take food right from our hands, or from the ground in front of her. Her keeper, Robert, answered questions about Limba as the humans around her looked around in awe. We found out Limba goes to the stream to play and soak twice a day, and once a weeks she gets sprayed with baby oil to keep her skin smooth - it takes 12 bottles to make sure all of her skin gets some! Hannah liked holding the animal food, "Monkey Chow" as the Zoo calls it, but got nervous the closer we got. I fed her a few of the balls, it was pretty amazing! 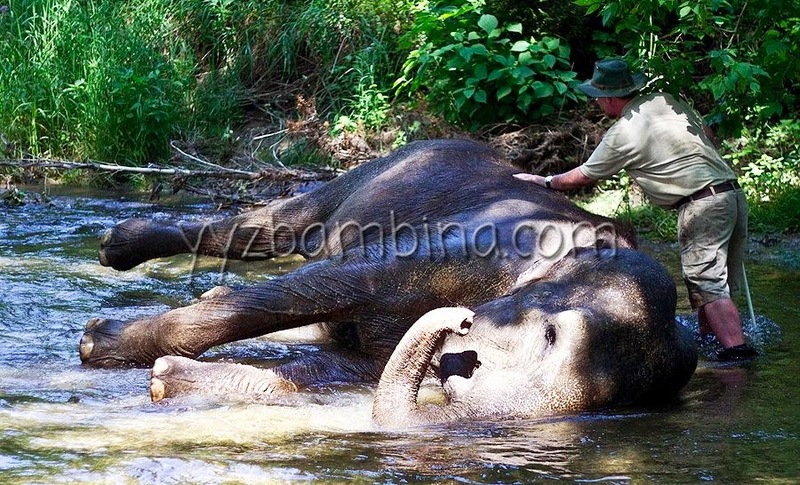 Limba's trunk was warm and wet as she suctioned the food with her trunk. After we met Limba, it was time to check out the wolves and camels before we headed to the Animatheatre for the 12 p.m. show. The Animatheatre has ample seating, and Hannah could see no problem sitting on my lap. 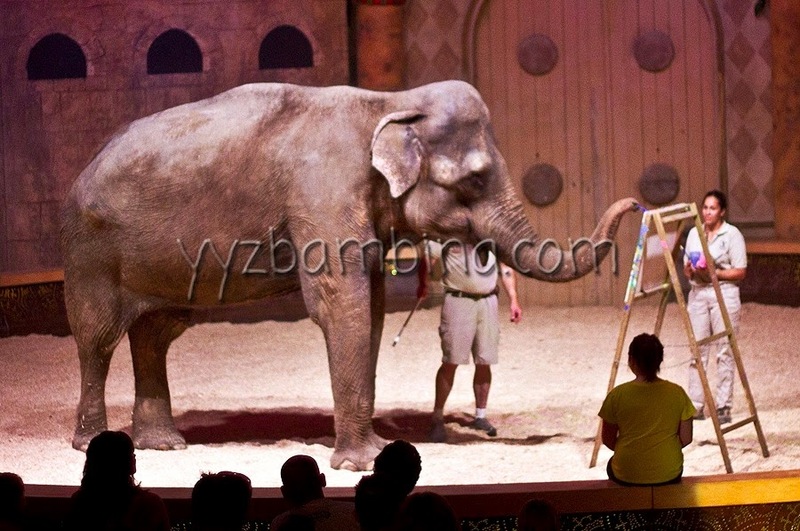 Hannah loved seeing the animals come out with their handlers. We learned about conservation efforts for those animals in danger, and sometimes, if they felt like it, the animals showed off their agility skills (they were never forced in to anything - the entire day I was impressed by how caring the staff are in regards to the animals). After the show, we headed back to the main gate for lunch. 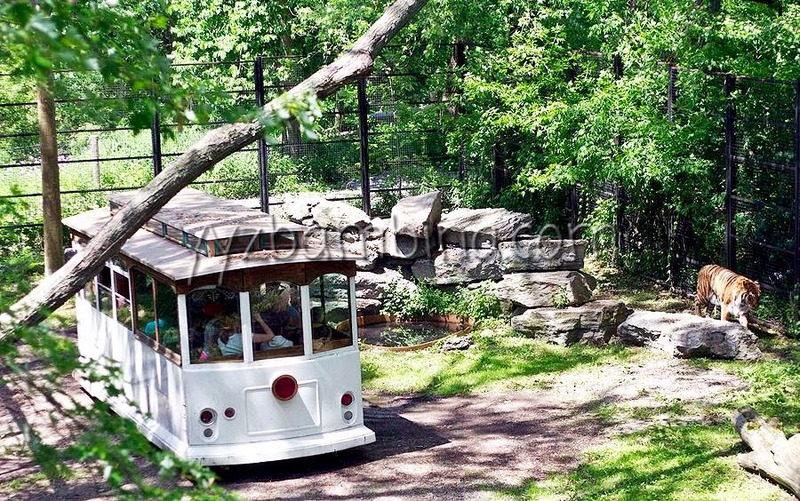 Having never visited the Bowmanville Zoo before, I was quite happy to find it was quite quick to get around - perfect for young children (and their parents) who may tire easily. For lunch we had hot dog and chicken fingers combos. The combos are reasonably priced and included a drink and fries. The Zoo serves paper straws, which are weird to use at first, but the safety of the animals obviously come first. There is also a large area with picnic tables for those families who pack a lunch. Then we headed to see the big cats and other animals. (You can check out the map to see all the animals who call the Zoo home.) We also stopped by the goats and cows (Hannah's favourite song right now is "Old MacDonald had a Farm", and her favourite verses are about the goat and the cow). While we were walking on the bridge in the Wild Woods, we saw the Expedition Predator trolly. We would have taken a ride, but by that point Hannah was napping in the stroller. We decided to stop at the gift shop before we went home. Hannah chose a stuffed green gibbon as a present - the first animals we saw when we stepped in to the zoo. We will be coming back in July or August to see the giraffes, check out the Splash Bash water park and partake in a carriage ride. Just under an hour from Toronto, the drive to Bowmanville is totally worth it. Right now the Bowmanville Zoo is having a promotion - the coupon below allows free entry for one child with a paying adult. A perfect time to visit! I know Hannah is too little to remember, but I will always cherish the day we spent as a family, and the thrilling experience of meeting Limba. Disclosure: My family and I were VIP Guests of the Bowmanville Zoo. The opinions on this blog, as always, are my own. These are great pictures! We just love going to the zoo and I like how each city's zoo is different! Same...you never know what to expect! I am at a loss for words. 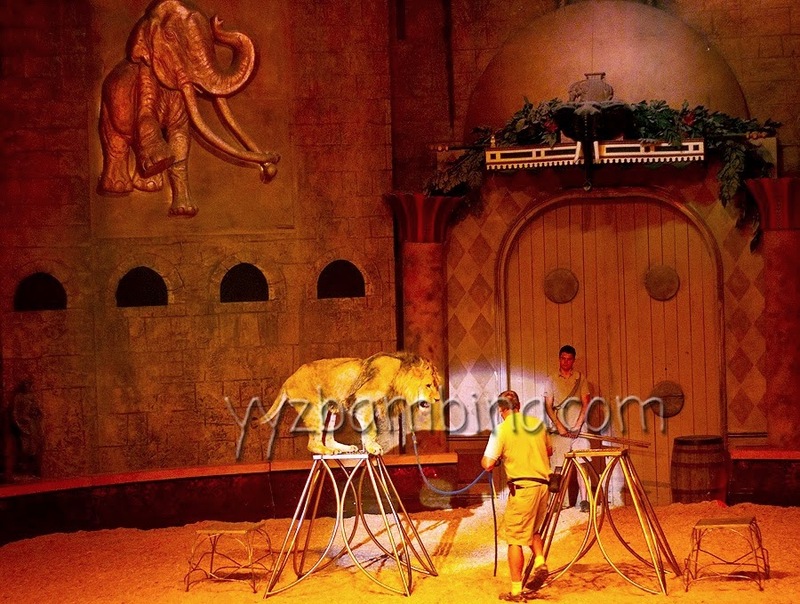 Feeding an elephant and you didn't have to fly across the globe to do it. 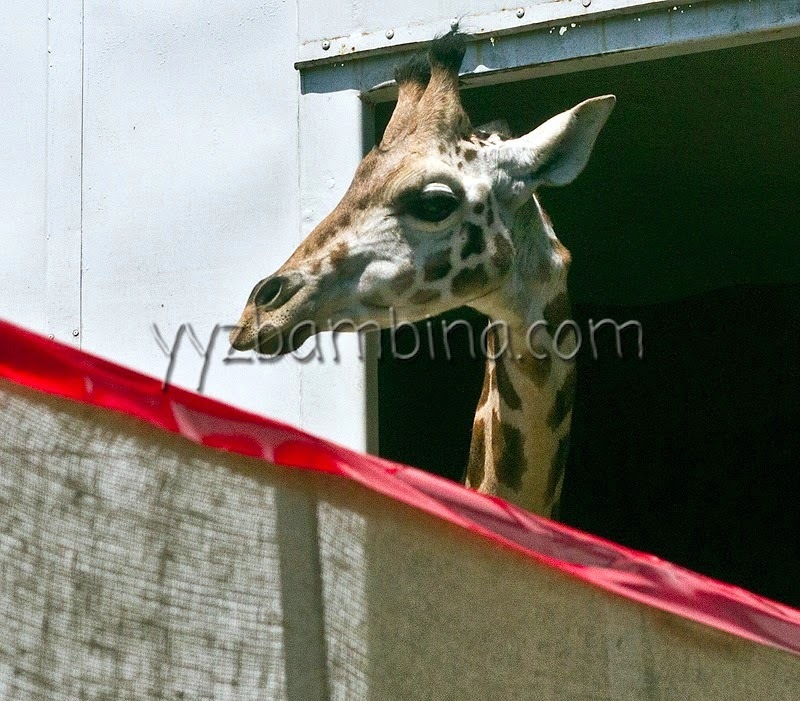 Yes, Limba is often just walking the grounds (so much so, I never ONCE saw her in her enclosure). I've never been to the Bowmanville Zoo although we drive past Bowmanville most weekends in the summer. This has made me want to visit. I had no idea they had such a great zoo. Can't wait to visit with the kids and learn first hand about the conservation efforts and hopefully get up close and personal with Limba. Same here! And it's quite close to the 401 - less than 5 minutes! What a wonderful experience for you and Hannah! 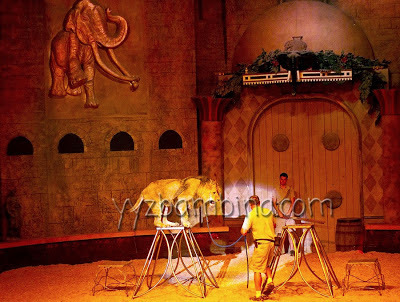 Love that you got to feed an elephant. I got to once but it was in Kenya! I've never been to the Bowmanville Zoo but thinking we should make it a family outing this summer. I'm jealous you got to feed an elephant in Kenya! That must have been an amazing experience. I love these pictures! It looks like a lot of fun! I've never been to the Bowmanville Zoo! Maybe to add to my summer bucket list! Awesome post of an amazing day! 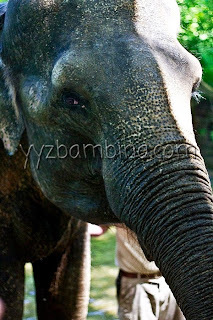 Meeting Limba up close and personal is a family highlight too. We just loved it! I also loved we got to experience it with you - so happy we got to spend some time together!